Black Pepper (Piper nigrum) stimulates the taste buds in such a way that an alert is sent to the stomach to increase hydrochloric acid secretion, thereby improving digestion. 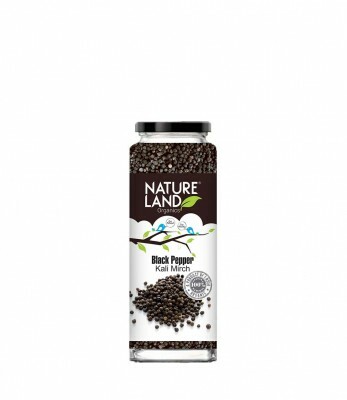 Natureland’s Organics Black Pepper has travelled a long way from wild lush green forests of Western Ghats, Karnataka, produced from the still-green unripe organic drupes of the pepper plant, boilded and sun dried, graded and handpicked to deliver the best taste and aroma. We aasure you that its purity and naturalness will take you on journey of lush green organic farms, unfolding the taste of health and nutrition that lingers for long. Savour the taste, Feel the aroma, honour the purity and discover the nature in you.